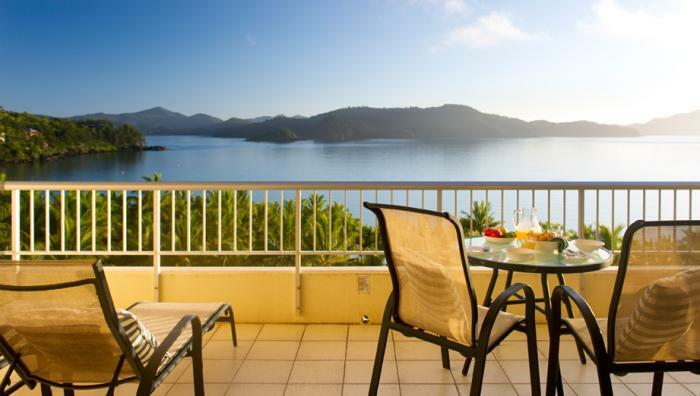 The Whitsunday Apartments are located on the resort side of Hamilton Island and offer well appointed, ocean facing, one bedroom apartments, which overlook beautiful Catseye Bay. These apartments, sleep up to 5 people. Prices are for accommodation only and include your return coach transfers between Hamilton Island Airport and the Whitsunday Apartments. 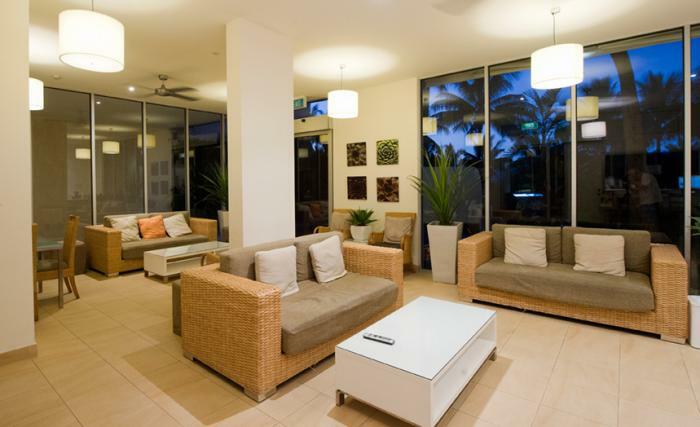 Whitsunday Apartments on Hamilton Island, are one bedroom, hotel style serviced apartments, situated on the resort side of the island and overlooking beautiful Catseye Beach. 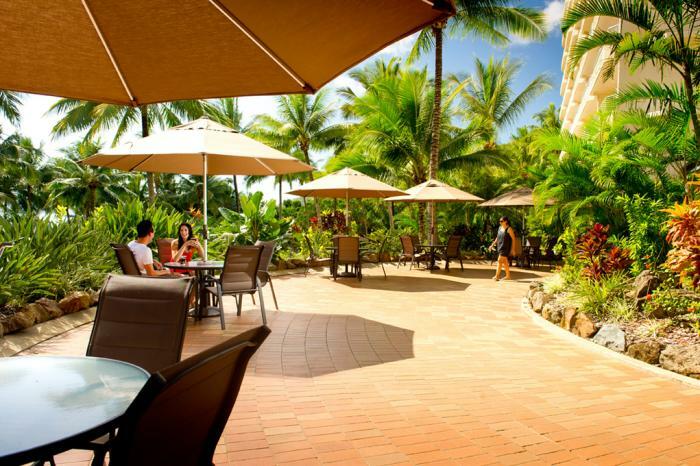 Whitsunday Apartments offer Hamilton Island holiday accommodation in self-contained apartments. They are the largest group of holiday apartments on the island, offering exclusive one day or long term stays. The complex has its own swimming pool and in addition, all of the resort facilities are available to all guests. The apartments consist of one King Size bedroom, a lounge, kitchen and dining area and have a large balcony overlooking beautiful Catseye Bay. Apartments are configured to sleep up to 5 adults and being only a few metres walk to the beach, they are ideal for small families. Complete with their own management team and 12hr reception area, these apartments are well suited to families and guests who prefer a little independence in their holiday. They have the convenience of hotel facilities such as mini bar and housekeeping, with the added flexibility of self-catering features. 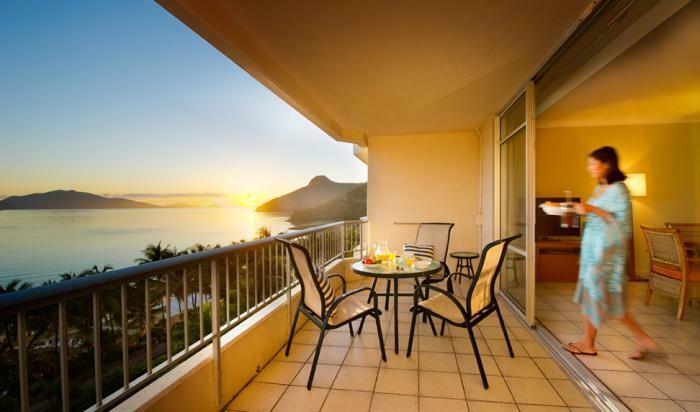 Deluxe Coral Sea View 1 bedroom apartments are located on the top floors, have contemporary decor and stunning views over Catseye Bay from their spacious balconies. These apartments are serviced daily. 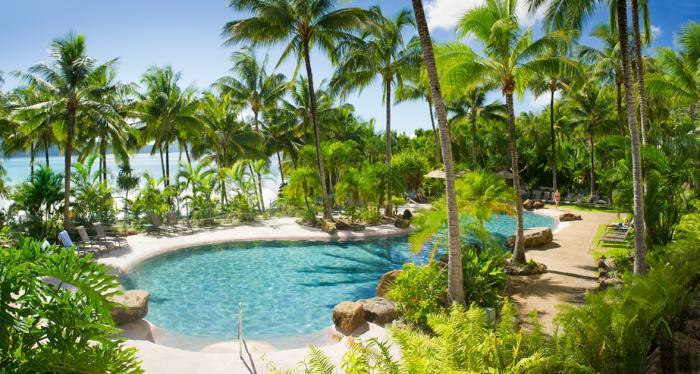 Whitsunday Apartments complex has its own swimming pool and Catseye Bay beach is literally a few metres away. Around the pool are lush, tropical landscaped gardens and you can take a short walk or buggy ride to Marina Village which has all the conveniences of a small town: a general store/ supermarket, post office, bank, pharmacy, bakery and bottle-shop are located there for those guests who want to stock up on supplies. 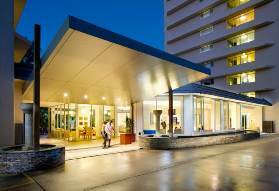 For information on ordering online see our Hamilton Island Information. Located on the highest floors of the Whitsunday Apartments, these refurbished, self-catering apartments have a stunning view over Catseye Bay to the Coral Sea and Whitsunday Island. 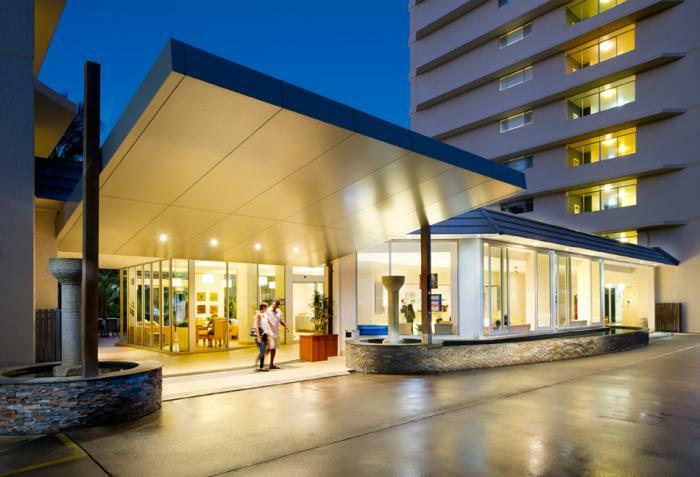 Return Bus Transfers between HI Airport/ HI Marina and Whitsunday Holiday Apartments. Use of scheduled ‘Island Shuttle’ bus service (please refer to seasonal timetable). Kids Stay Free (0-12 years) when staying with paying Adult/s and using existing bedding. Additional guest charges $39.00 per night: apartment sleeps maximum 5. Enjoy the views from your balcony! Includes a fully equipped kitchen, ensuite bathroom, lounge/ dining room. With Air-conditioning & ceiling fans. All apartments sleep up to 5 people: King size bed and single divan in the bedroom and 2 single divans in lounge. • Payment: deposit of 1 night is required by this accommodation. Full Payment on check-in. • Cancellation: full fee charged by this property if cancelled within 7 days of reservation, or ‘no show’. Attended 12 hours a day for your convenience.